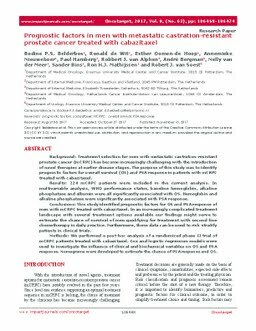 Background: Treatment selection for men with metastatic castration-resistant prostate cancer (mCRPC) has become increasingly challenging with the introduction of novel therapies at earlier disease stages. The purpose of this study was to identify prognostic factors for overall survival (OS) and PSA response in patients with mCRPC treated with cabazitaxel. Results: 224 mCRPC patients were included in the current analysis. In multivariable analysis, WHO performance status, baseline hemoglobin, alkaline phosphatase and albumin were all significantly associated with OS. Hemoglobin and alkaline phosphatase were significantly associated with PSA response. Conclusions: This study identified prognostic factors for OS and PSA response of men with mCRPC treated with cabazitaxel. In an increasingly complicated treatment landscape with several treatment options available our findings might serve to estimate the chance of survival of men qualifying for treatment with second-line chemotherapy in daily practice. Furthermore, these data can be used to risk-stratify patients in clinical trials. Methods: We performed a post-hoc analysis of a randomized phase II trial of mCRPC patients treated with cabazitaxel. Cox and logistic regression models were used to investigate the influence of clinical and biochemical variables on OS and PSA response. Nomograms were developed to estimate the chance of PSA response and OS.